You can’t live without the coenzyme NAD+, nicotinamide adenine dinucleotide. Here’s why it’s so important, how it was discovered, and how you can get more of it. NAD+, or nicotinamide adenine dinucleotide, is a coenzyme found in all living cells, and it’s required for the fundamental biological processes that make life possible. But NAD+ levels decline as we age. NAD+ has two general sets of reactions in the human body: helping turn nutrients into energy as a key player in metabolism and working as a helper molecule for proteins that regulate other biological activity. These processes are incredibly important because they are responsible for regulating oxidative stress and circadian rhythms while maintaining the health of DNA and keeping humans healthier for longer. Open any biology textbook and you’ll learn about NAD+, which stands for nicotinamide adenine dinucleotide. It’s a coenzyme found in all living cells that’s required for the fundamental biological processes that make life possible, from metabolism to DNA repair. NAD+ is hard at work in the cells of humans and other mammals, yeast and bacteria, even plants. Nothing can live without NAD+, and low levels are often accompanied by negative health consequences. Scientists have known about NAD+ since it was first discovered in 1906, and since then our understanding of its importance has continued to evolve. For example, NAD+ precursors played a role in mitigating pellagra, a fatal disease that plagued the American south in the 1900s. Scientists at the time identified that milk and yeast, which both contain NAD+ precursors, alleviated symptoms. Over time scientists have identified several NAD+ precursors — including nicotinic acid, nicotinamide, and nicotinamide riboside, among others — which make use of natural pathways that lead to NAD+. Think of NAD+ precursors as different routes you can take to get to a destination. All the pathways get you to the same place but by different modes of transportation. Recently, NAD+ has become a prized molecule in scientific research because of its central role in biological functions, with research in animals tying NAD+ to notable benefits. The scientific community has been researching how NAD+ relates to overall health and age-related diseases. For example, a 2016 study found that mice and worms with degenerative muscles had improved muscle function when supplemented with NAD+ precursors. A 2017 study showed that mice supplemented with an NAD+ precursor experienced an increase in DNA damage repair, with tissue in two-year-old mice given the NAD+ precursor looking identical to tissue in three-month-old mice. And a 2018 study found that mice with NAD+ precursor supplementation had improved cognitive function, pointing to signs of therapeutic potential for Alzheimer’s disease. These are only some of the recent findings, all of which continue to inspire researchers to translate these findings to humans, exploring the potential for NAD+ to positively affect human health through supplementation. So how exactly does NAD+ play such an important role? In short, it’s a coenzyme or “helper” molecule, binding to other enzymes to help cause reactions on the molecular level that produce positive outcomes on the everyday health level. NAD+ has two general sets of reactions in the human body: helping turn nutrients into energy as a key player in metabolism and working as a helper molecule for proteins that regulate other biological activity. But the body doesn’t have an endless supply of NAD+. In fact, it actually declines with age. But the body doesn’t have an endless supply of NAD+. In fact, it actually declines with age. The first study showing this decline, from 2012, examined human skin and established the coenzyme as vital to aging research. In 2015, another human study furthered this proof by showing similar NAD+ decline in the human brain. 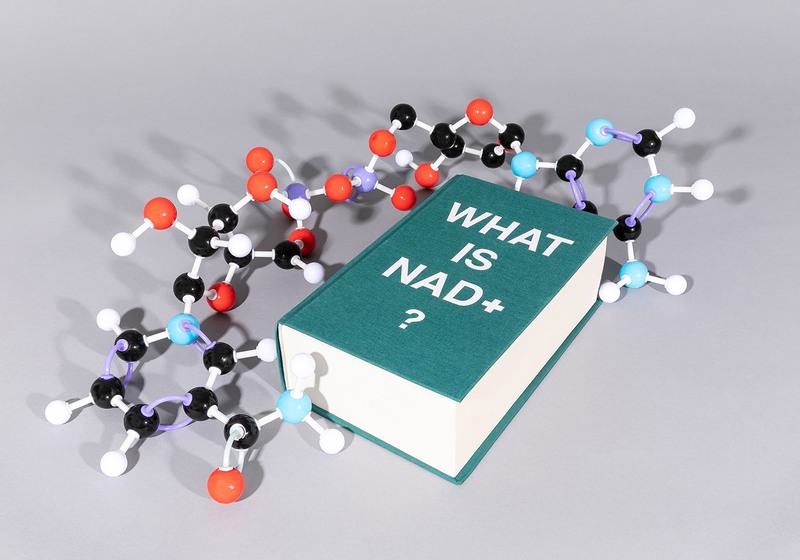 The history of NAD+ research, and its recent establishment in the science of aging, has opened the floodgates for scientists to investigate how humans can maintain their NAD+ levels and get more of it. What is the history of NAD+? NAD+ was first identified by Sir Arthur Harden and William John Young in 1906 when the two aimed to better understand fermentation — in which yeast metabolize sugar and create alcohol and CO2. It took nearly 20 years for more NAD+ recognition, when Harden shared the 1929 Nobel Prize in Chemistry with Hans von Euler-Chelpin for their work on fermentation. Euler-Chelpin identified that the structure of NAD+ is made up of two nucleotides, the building blocks for nucleic acids, which make up DNA. The finding that fermentation, a metabolic process, relied on NAD+ foreshadowed what we now know about NAD+ playing a critical role in metabolic processes in humans. Otto Heinrich Warburg — known for “the Warburg effect” — pushed the science forward in the 1930s, with research further explaining NAD+ playing a role in metabolic reactions. In 1931, the chemists Conrad A. Elvehjem and C.K. Koehn identified that nicotinic acid, a precursor to NAD+, was the mitigating factor in pellagra. United States Public Health Service Doctor Joseph Goldberger had previously identified that the fatal disease was connected to something missing in the diet, which he then called PPF for “pellagra preventive factor.” Goldberger died before the ultimate discovery that it was nicotinic acid, but his contributions led to the discovery, which also informed eventual legislation mandating the fortification of flours and rice on an international scale. While scientists had now realized that NAD+ played a crucial role in overall health, they had yet to discover its intricate impact on a cellular level. Forthcoming technologies in scientific research combined with comprehensive recognition of the coenzyme’s importance ultimately encouraged scientists to study NAD+ as a part of the aging process. Our current understanding of the importance of NAD+ really began in the 1960s. Using nuclear extracts from hen liver, French scientist Pierre Chambon identified a process called Poly ADP-ribosylation, where NAD+ is broken down into two component parts, one of which (nicotinamide) gets recycled, while the other (ADP-ribose) meets up with a protein to repair cells. This research formed the foundation of the field of PARPs, or poly (ADP-ribose) polymerases, a group of proteins that rely on NAD+ to function and regulate DNA repair, among other biological functions. PARPs are similar to another group of proteins called sirtuins in that they both only function in the presence of NAD+. Sirtuins have been called “the longevity genes” and “guardians of the genome” for their role in regulating cellular health and, as a result, aging. Sirtuins are a group of proteins that were first discovered in the 1970s but their dependence on NAD+ wasn’t realized until the 1990s. Elysium co-founder and MIT biologist Leonard Guarente identified that SIR2, a sirtuin in yeast, extended the life of the yeast only when it was activated by NAD+. “Without NAD+, SIR2 does nothing. That was the critical finding on the arc of sirtuin biology,” Guarente said. This finding provided further understanding about NAD+ and aging. Knowing that NAD+ plays a role in metabolism by turning nutrients into energy and then that sirtuins rely on NAD+ to function created a clear link between sirtuins and metabolism. It also clued scientists in on a crosstalk between biological functions, i.e., that metabolism is intricately related to other biological processes that are critical to health. This meant changes in NAD+ levels could make or break other vital functions in the body. It also inspired more research on a topic previously overlooked. “There are maybe 12,000 papers on sirtuins now. At the time we discovered the NAD+ dependent deacetylase activity the number of papers was in the 100s,” Guarante’s said. In 2004, scientists discovered the nicotinamide riboside kinase pathway, identifying that nicotinamide riboside (NR) is the most direct precursor to NAD+. Humans get NAD+ from their diet via foods made up of amino acids that are also precursors to NAD+. However, NR is the most efficient precursor to NAD+. If NAD+ precursors are different routes you can take to get to a destination, NR is the best available route. The nicotinamide riboside kinase pathway discovery led scientists to work toward creating a better NAD+ supplement, thinking outside the diet to access it. This discovery cemented NR as the most direct way to boost NAD+, answering the age-old question: We know what NAD+ can do, but how do we get more of it? For nearly 100 years we’ve known that NAD+ is incredibly important, but the gradual pace of scientific research and technological development has only now begun to reveal how we can make the most of it for humans. Knowing the history of NAD+ and subsequent discoveries around the coenzyme has led researchers to explore what the science community can now do with the information. NAD+ has enormous potential and how it will be fulfilled is the most exciting aspect of current research. Recent studies in animals treated with NAD+ precursors show promise. For example, a 2013 study in mice found that increased NAD+ levels could restore mitochondrial function, and a 2018 study out of MIT promoted growth of blood vessels and muscle in elderly mice thanks to NAD+-activated sirtuins. There’s much more to discover, with scientists working to figure out just how far NAD+ can go when it comes to the health of the human body. A human study from 2017, conducted by Elysium Health, found that regular doses of an NAD+ precursor increased NAD+ levels by an average of 40 percent. So far, all signs point to a promising future.